In a time of instant gratification, we know you don’t want to wait for your new bathtub, so that’s why at West Shore Home we’re committed to getting the job done fast. Other companies might tear your bathroom apart, rendering it useless for days or even weeks at a time. This disrupts your life and turns what should be an awesome experience into a nightmare. As our customer, that’s a scenario you don’t have to worry about. Our certified and trustworthy installers will show up on time and have your new bathtub installed the very same day, minimizing the impact on your daily life and allowing you to focus on enjoying your remodel. With a large selection of options and accessories, you can customize your new bathtub exactly the way you want it. Choose from a variety of colors and finishes, the type of tile pattern you want for your wall surround, plus accessories like grab bars and shelving. Our bathtubs and wall surrounds are made from nonporous acrylic that is infused with an antimicrobial agent, which means your new tub will resist cracking, chipping, staining, mildew, and bacteria growth. By just wiping down the surfaces, you can easily maintain a stunning bathtub that will last for years to come. Our products are made of durable materials that resist wear and tear, so your new bathtub will look new for decades with minimal maintenance. Our bathtubs are infused with an antimicrobial agent that prevents bacteria from growing and reproducing, ensuring your new tub surface stays fresh and clean. 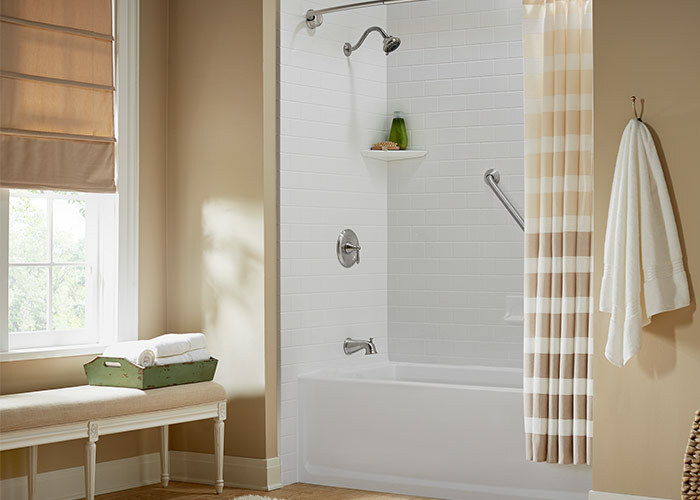 Because there’s no grout to scrub and our tubs are mold, mildew, and stain resistant, cleaning your new bath is a breeze. By simply wiping the nonporous surfaces, you can effortlessly maintain a clean bathroom space. No time to wait? No problem – Contact us today and we’ll get started on your bathroom remodel right away. A design consultant will come to your home, assess your bathroom, and give you a quote on the spot. We’ll have your bathroom remodel completed in just one day. Because drawn-out home improvement projects are a thing of the past. I am beyond pleased with my new master bathroom shower installation that Tyler and David did for me! They are both very professional and a pleasure to have worked with! I would highly recommend Tyler, David and West Shore Home for any bathroom renovation and installation of their great product and professionalism! Rob & Darren did a great job on our install. It was nice to have them come in and complete the job in one day. They even covered up my garage to be sure not to make a mess. They were very nice and worked hard. You would not have known that they had even did it with such a good clean up job. Our daughter was so surprised when she returned from conference. She loves her new shower. Thank you. West Shore sold and installed a wonderful shower. Very professional job well done. Could not have had a better experience. From in home design through install, everyone was wonderful. My shower looks fantastic and the cleanup was exceptional. Thank you Jeff L. & Mick M. for the beautiful upgrade. I can, and will, recommend West Shore to everyone.